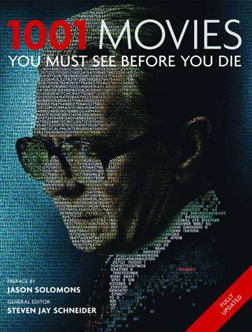 Seeing as the cover of the next edition of the 1001 Movies You Must See Before You Die has been announced (the book is due to be released next month), I thought it’d be a good time to review the film on said cover, as it’s a certainty to become a member of the hallowed list in the imminent future. So, without further ado, I present Tinker Tailor Soldier Spy, a film that I was very surprised to see on the cover, as personally I don’t think I’d have included it in the book at all, giving the cover space instead to probably The Artist, even if the Tinker Tailor poster is better. It’s only fitting that such a muddled up film should have a relatively incoherent review, so I’m going to jump in randomly and start with the cast. It’s pretty goddamn incredible that such a stellar cast, comprising of some of the best British actors from varying generations working today, could be assembled for one film. 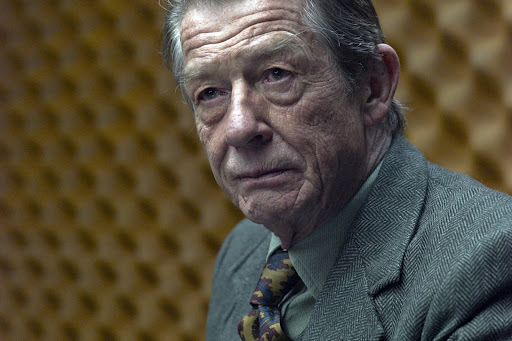 You’ve got the likes of John Hurt amongst the more senior players, Toby Jones, Colin Firth, Mark Strong, Ciarin Hinds and Kathy Burke as the seasoned actors as well as up-and-comers like Benedict Cumberbatch and Tom Hardy, not to mention bit roles for Stephen Graham, Roger Lloyd-Pack and Christian McKay. And, of course, Gary Oldman. It just goes to show the strength of the source material that such a great cast, and director Tomas Alfredson, straight from his similarly bravura Let The Right One In, would flock to it. Even Colin Firth was willing to take what is essentially a tangential role after just having won a Best Acting Oscar for The King’s Speech. It takes a brilliant actor to not only attempt to replace the likes of Alec Guinness, James Mason and Dunholm Elliot – all of whom have played the character of George Smiley before – but to in fact outshine them as arguably the definitive screen version of Smiley. Oldman is magnificent in a pared down, stripped back performance almost entirely devoid of movement, yet the cogs behind his eyes are just about audibly whirring away as he sits and watched, drinking everything in and analysing the situation. Smiley rarely utters a word or makes an extraneous movement – his first utterance is a good 16 minutes in, after having appeared in several scenes already. He shines even beneath the massive glasses and dour overcoat that would envelop a lesser actor. Remarkably, Tinker Tailor marks Oldman’s first ever Oscar nomination, for Best Actor, naturally, which he justifiably lost to Jean Dujardin for the aforementioned The Artist, but I believe Oldman came a close second. I myself was shocked to find he’s never even be nominated, but when you look back through his body of work there aren’t many roles that you could argue he should have been awarded for. Perhaps Sid and Nancy, but that wasn’t terribly well received I think, and doesn’t really fit in with the kinds of films that the Oscar board tend to take notice of, and in everything else he’s either been the bad guy – rarely awarded by the academy (at least until The Dark Knight) – or performs well in a small role, lost amongst an ensemble cast of similar abilities to himself – see True Romance, Harry Potter and Batman. You’ve also got to take into account some of the more questionable roles in his career – playing a dwarf in Tiptoes anyone? So it’s nice to think that, with so many outlandish, extravagant roles under his belt – The Fifth Element, Leon – it is Oldman’s most quiet, restrained and subdued performance that earned him the Oscar nod. I’m not even going to try and explain the plot of this film as, after having watched it and read John Le Carre’s book upon which it is rigidly based I could still only pin point the major issues. Basically, Smiley has been brought back into The Circus – the nickname for the British Intelligence – to try and find a mole from within a small group of higher ups – a group that used to contain him. His boss is/was John Hurt’s Control, and the suspects are the shifty Toby Estergase (David Dencik, a Swedish actor I’ve not come across before, but who played different roles in the two versions of The Girl with the Dragon Tattoo, and is suitably engaging here), the suave, womanising Bill Haydon (Colin Firth), “poison dwarf” head honcho Percy Alleline (Toby Jones) and his right-hand man Roy Bland (Ciarin Hinds). 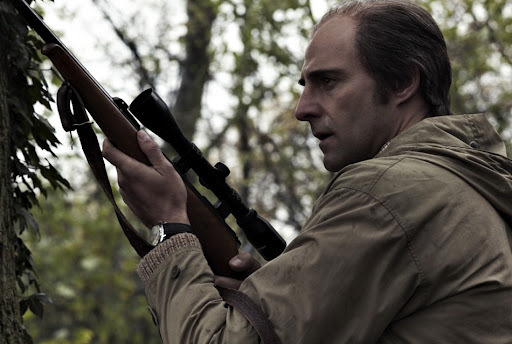 We are also shown, in parallel, the story of field agent Jim Prideaux (Mark Strong, in a rare and disorientating non-bad-guy role), whose shooting on assignment may have caused the suspicion back at headquarters. Assisting Smiley is Peter Guillam (Benedict Cumberbatch), a trustworthy up-and-comer with a way with the ladies, and Tom Hardy plays Ricki Tarr, the unreliable young firebrand whom Smiley introduced to the industry, and who may hold the key to the mystery. Everyone is perfectly cast, and there isn’t a weak link amongst them. Similarly, the mood of the film is spot-on, and there is never so much as a red or a green on screen at any point, everything is in varying shades of grey, brown and taupe, from the sky to the clothes, the walls to the cars. The entire thing may as well have been shot in sepia, as it’s apparently been set in a time before colour was invented. The many conversations throughout mostly take places in dusty, dingy rooms yellowing with tobacco. It’s unusual for a film that some of the flashback sequences are actually more vibrant and brightly lit than those set in the film’s present, which could be read as an indication that perhaps those sunnier days were better for everyone involved, with less conspiracies and deception. Or at least, less in the current direction. So, why did I have such a problem with this film? Well, mainly it’s because it’s so damn confusing. I understand that that’s entirely the point, and that some elements of the plot – when which bits are set in relation to others – are only roughly clarified towards the end to aide this sense of confuddlement, but even having read the book I still couldn’t tell what everyone was doing and why. This could also be because I didn’t really care. None of the characters are particularly likable, with the possible exception of Guillam and Prideaux at times, and even knowing who the final reveals didn’t help me very much. That’s something to praise, I suppose, that knowing the ending doesn’t lessen my appreciation for the film, but that’s a little bit of damning with faint praise if you ask me. The most fun thing I found about this film is playing ‘Spot the Harry Potter Actor’ during it (Can anyone beat my six?). Though the performances are all impeccable and the atmosphere is both what was aimed for and what it should be, I cannot recommend this film on the basis that I didn’t enjoy it, and I’m still not sure what it was about – yet I don’t really mind. This entry was posted in 08/10, 1001, Choose Life, Empire Top 301, Review and tagged Benedict Cumberbatch, Christian McKay, Ciarin Hinds, Colin Firth, David Dencik, Gary Oldman, John Hurt, John Le Carre, Kathy Burke, Mark Strong, Roger Lloyd-Pack, Steven Graham, Tinker Tailor Soldier Spy, Toby Jones, Tom Hardy, Tomas Alfredson by jaycluitt. Bookmark the permalink. I wasn't thrilled by this movie, but not because it was confusing, but because the casting killed all possibility of suspense for me on who the mole was.SPOILER WARNINGSo let's see. We've got four people who might be the mole. One is played by a Swedish actor few people have ever seen, two are played by recognizable character actors, and one is played by an Academy Award winning actor. Gee, I wonder who the mole is going to be.I read a quote from Firth basically acknowledging that his casting kills the suspense, but he justifies it as "everyone has seen the original and already knows the story, so it doesn't matter". Sorry Colin, but I've never seen either the original movie, nor read the book. If you want to talk about spoilers, I was reading the book during the marketing campaign, and I ran across these posters [SPOILER]: http://www.totalfilm.com/news/paul-smith-designs-minimalist-tinker-tailor-soldier-spy-posters in which the last one clearly labels the identity of the spy. Talk about infuriating, as I was 3/4 of the way through the book!